I usually don’t write articles, but I thought it would be interesting to share some recent experience I had with this camera. So before you read on, just keep in mind, that I’m not a professional repairman and there may be some real big mistakes in this article…. 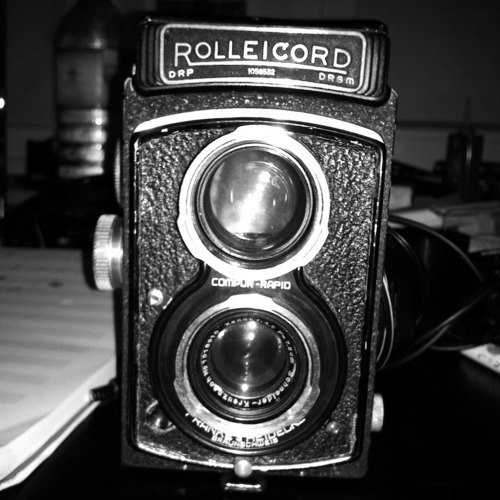 Anyway, here is the story: I found this lovely rolleicord for 30 euros on a flea-market and couldn’t resist buying it. The camera wasn’t usable when I bought it, as the slow shutter speed were stuck, selecting knob for shutter speed was not fluid anyway, and there was no focusing screen in it! 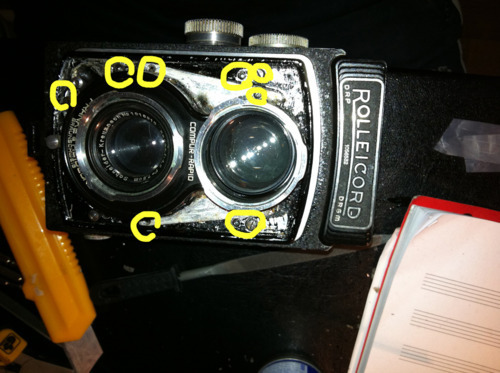 So the rollei landed on my shelf as a decorative camera at first…. Some month later, I thought I would give it a try, and searched the internet for more information. You take a cd jewel case, cut it to the right dimension and file it with sandpaper on both sides. Finished! You have a matte screen as a cheap replacement/alternative. Of course, it turns out to be very very dim, but for now it is just fine. But I think I will look for a real screen in a near future. I used a cutter to carefully remove the leather covering, but found out later some people use water to dissolve the glue…. will try this next time…. Pull away the metal cover. 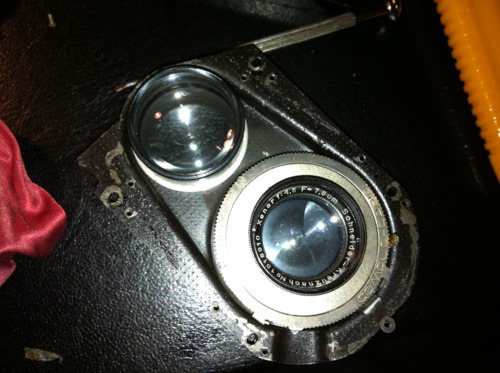 This is really tricky because of the shutter button (which needs to be taken apart so you can remove this metal cover). To remove the lens, just unscrew it. 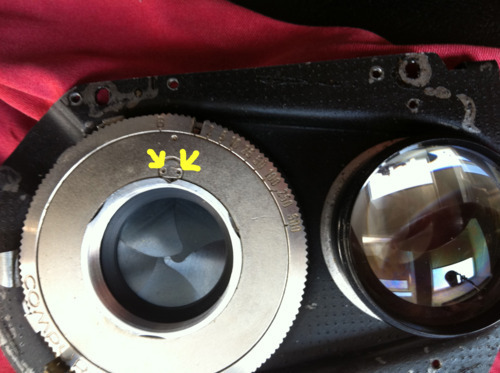 Now you need to remove this metal ring, to fully access the shutter mechanism. 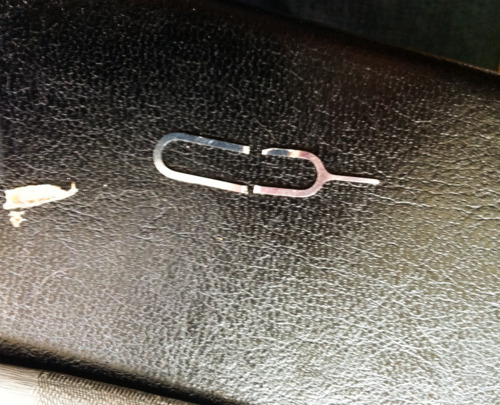 But you will need a specialised camera repair tool to unscrew this little “screw” (see picture below). Well, to do so I made my own tool…. 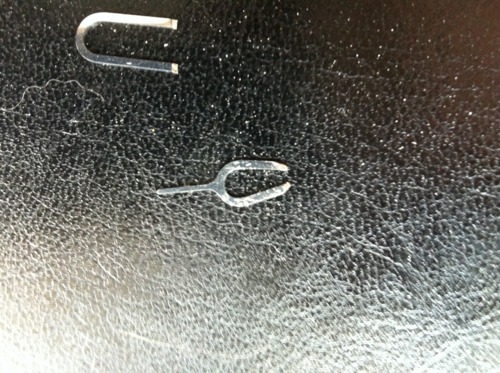 out of an Iphone sim card ejector! Just cut it halway, file the border so it fits the tiny holes and bend it to the right size. Finished! 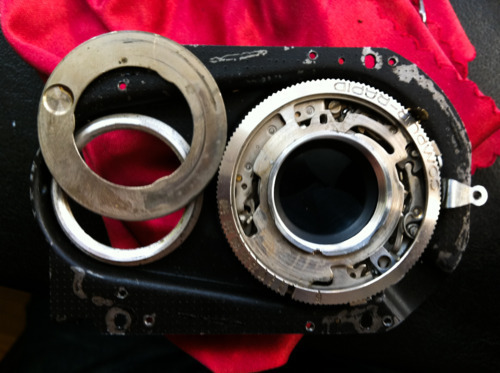 Note that I didn’t play with the mechanism with this ring removed…I don’t really know what could happen…. At this point, the easiest way of cleaning it, is to use the “flood-cleaning” method.Put a generous amount of lighter fluid on the parts you want to clean, let it dissolve oil and dirt, then clean up with paper towel. Repeat if necessary. I let it dry a night long before reassembly just to be sure….The results have turned great so far: All shutter speeds are working again! and they do very smoothly, you can really see the difference before and after cleaning. 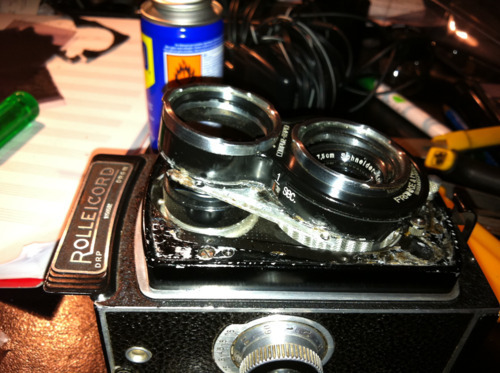 Of course I also cleaned all the other parts in a lighter fluid bath before reassembling my camera. Thanks for sharing your experience and know-how. I found it informative and helpful. Have taken any photos since the cleaing?